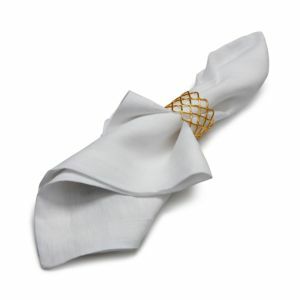 European napkin rings and table accessories add sophistication to every meal. 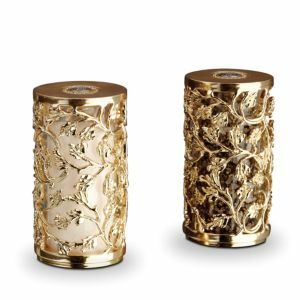 Artisanal 24K gold-plated metal braided details artfully distinguish these sculptural handcrafted table accents from L'Objet. 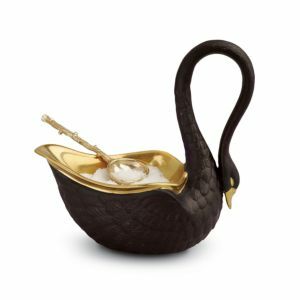 Taking cues from 19th-century Empire Era porcelain objects, this sculptural swan-inspired salt cellar from L'Objet is created entirely by hand and accented with an exquisite 24K gold bowl. Sparkling crystals and artisanal metal details artfully distinguish these sculptural handcrafted table accents from L'Objet. 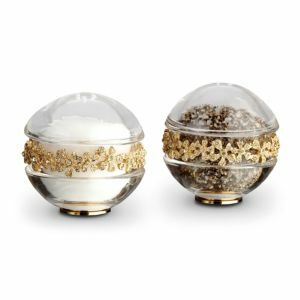 Sculptural, handcrafted salt and pepper shakers from L'Objet lend an elevated note to entertaining Sparkling crystals and artisanal metal details artfully distinguish these sculptural handcrafted table accents from L'Objet. Sparkling crystals and artisanal metal details artfully distinguish these sculptural handcrafted table accents from L'Objet. 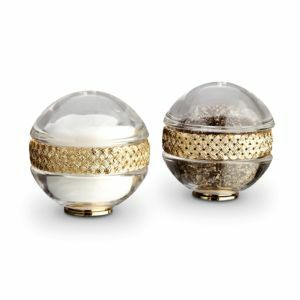 L'Objet's handcrafted salt-and-pepper set brings a sparkling modern element to the table. 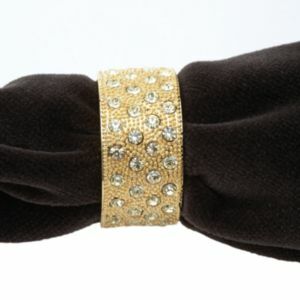 Elegantly present place cards for special dinners with L'Objet gold accessories adorned with hand-set Swarovski crystals. Elegantly present place cards for special dinners with L'Objet platinum accessories adorned with hand-set Swarovski crystals. 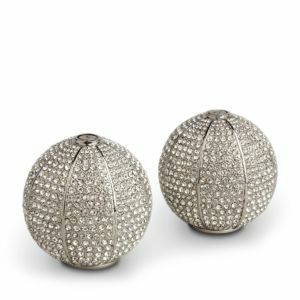 Bring a touch of texture and shine to special meals with these sculptural handcrafted table accents from L'Objet. Bring a touch of texture and shine to special meals with these sculptural handcrafted table accents from L'Objet. Bring a luxurious touch of style to your tabletop with this striking assortment of serveware. 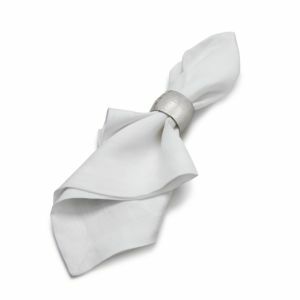 Gleaming like polished, precious metal, our Silver Napkin Rings lends a regal air to the finest table linens. 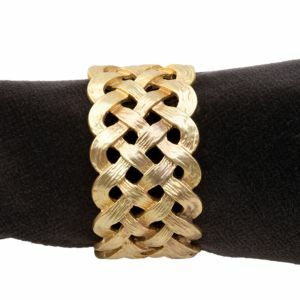 Its intricate, interlaced design, like Old-World metalwork, evokes a family crest, making it a focal point for your table, and an artifact to be passed on for generations. 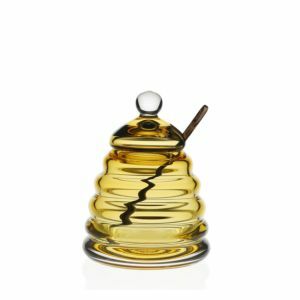 Lustrous in a golden satin finish, and sculptural in its dimensional, diamond-like facets, it performs a kind of alchemy on an everyday table, remaking it into a more brilliant, elevated version of itself. Handcrafted porcelain cappuccino cup. Includes pewter saucer. Handcrafted bowl. Pewter and glass. Handmade in Italy. 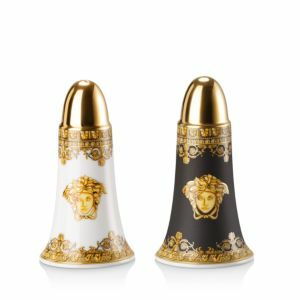 Handcrafted salt and pepper shakers. Pewter and glass. Handmade in Italy. Lead free glass Elevate a dinner or party with the distinctive brass-handled design of this set of four Godinger Haper stainless steel dessert spoons. Ceramic stoneware. Dishwasher, freezer, microwave, and oven safe. From the Lismore Collection of Waterford®. Handcrafted clear lead crystal with wedge and diamond cuts. Silvertone lids. Fine porcelain. 8.3"W x 4.25"D x 2.5"T. Dishwasher and microwave safe. Fine porcelain. 3"Dia. x 6.8"T. Dishwasher and microwave safe. 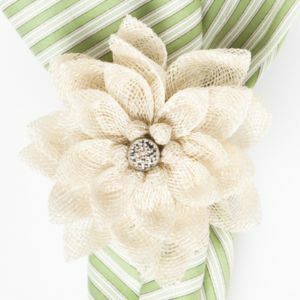 To be used as a placemat or centerpiece. Natural Guinea and natural almond pheasant feathers. Wood charger plate. Handcrafted Lady Amherst pheasant feathers charger. Natural feathers for placemat or centerpiece. The Rufolo Glass Organic Service Plate/Charger is a beautiful addition to any table. 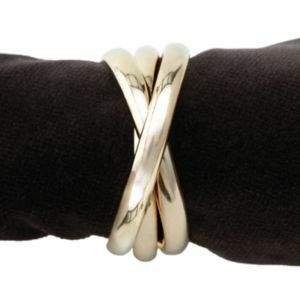 Pair with the current Rufolo Glass collection or mix and match to create a truly elegant table setting. Does your tablescape need an update before your dining room debut? 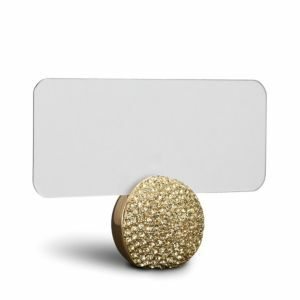 Friday-night dinners just got swankier with the ultra trendy, cocktail party approved Pastel Glass Service Plate/Charger Add a touch of glam to all of your summer occasions with the Glitter Glass Service Plate/Charger. Designed in Italy, this collection easily adds charm to any tablescape. Add a touch of glam to all of your summer occasions with the Glitter Glass Service Plate/Charger. Designed in Italy, this collection easily adds charm to any tablescape Add a touch of glam to all of your fall occasions with the Glitter Glass Service Plate/Charger. 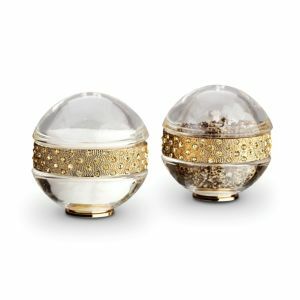 Designed in Italy, this collection easily adds charm to any tablescape Add a touch of glam to all of your summer occasions with the Glitter Glass Service Plate/Charger. Designed in Italy, this collection easily adds charm to any tablescape. Featuring our thread and berry motif, this classic foundation piece elegantly frames your place setting and doubles as an abundant dinner plate or serving platter. Charger plate made of natural cork. Charger plate made of ceramic stoneware. Oven, microwave, dishwasher, and freezer safe. Antiqued charger with raised beaded border. Polypropylene. The handsome copper-finish textured rims of the Godinger hammered copper charger set complete a tablescape with uncommon style. 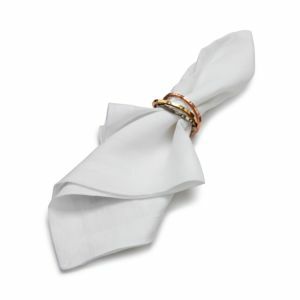 Textured napkin ring. 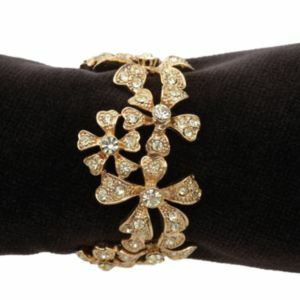 Nickel and brass plated aluminum. 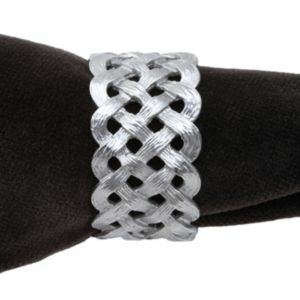 Textured napkin ring. Nickel and brass plated aluminum. 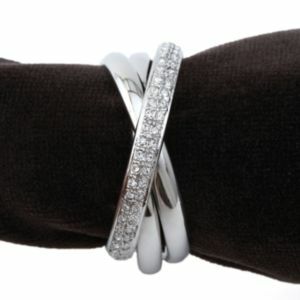 Textural and beautifully detailed, we use this chic ceramic napkin ring for absolutely every occasion - from casual to formal.